President Donald Trump is putting the United States on a dangerous path to devastating wars by shuffling his national security team to assemble a war Cabinet. 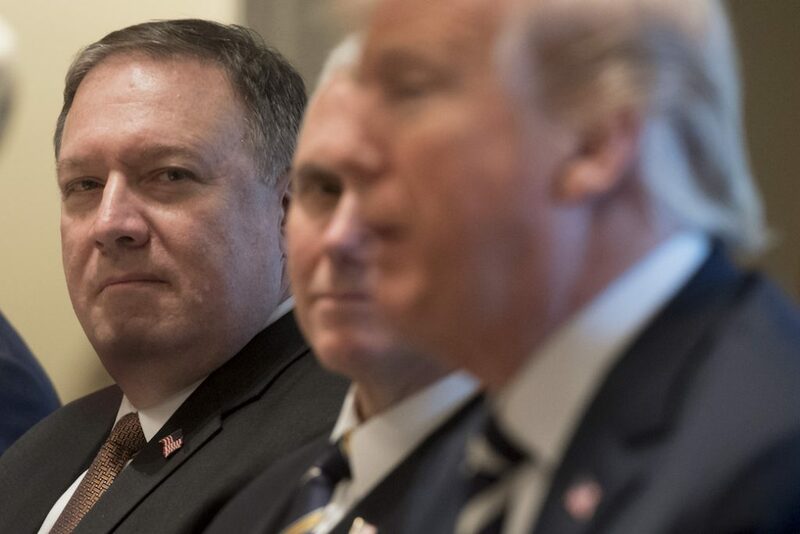 To fill the position of America’s top diplomat, President Trump has chosen the hawkish current CIA Director Mike Pompeo—a man who notoriously prefers regime change to diplomacy. And newly appointed National Security Adviser John R. Bolton was one of the principle architects and defenders of the Iraq War; wants to abrogate the Iran deal; and appears eager to launch preventive military strikes against North Korea. Both Pompeo and Bolton replace less hawkish advisers and will enable the worst instincts of the already erratic and reckless President Trump. By nominating Pompeo and appointing Bolton, Trump has chosen a path that could lead to war. The stakes are already extremely high: President Trump simultaneously looks set to withdraw from the Iran nuclear deal—which has successfully prevented Iran from obtaining a nuclear weapon—and is pursuing even more ambitious negotiations with North Korea in order to convince leader Kim Jong-un to abandon any existing nuclear weapons and ballistic missiles. Pompeo and Bolton would exacerbate both of these challenges. On the first anniversary of the Iran deal, when all evidence suggested that Iran was complying with the terms of the deal that prevented it from obtaining nuclear weapons, Pompeo wrote that “Congress must act to change Iranian behavior, and, ultimately, the Iranian regime.” And after President Trump’s election, Pompeo wrote in a tweet, “I look forward to rolling back this disastrous deal with the world’s largest state sponsor of terrorism.” As secretary of state, Pompeo will play a key policy role in the Trump administration and will be able to encourage the president to withdraw from the Iran deal. President Trump has repeatedly threatened to unilaterally withdraw from the Iran deal. His previous national security team—including outgoing National Security Adviser H.R. McMaster and former Secretary of State Rex Tillerson—had prevented him from walking away. President Trump even said he was removing Secretary Tillerson over their disagreement on whether the United States should stay in the Iran deal. Replacing them with Bolton and Pompeo will only enable President Trump’s recklessness. Based on their recent statements, Bolton and Pompeo may prefer that those talks collapse to clear the way for military strikes. Bolton said earlier this year that “talking to North Korea would be fruitless.” He followed that up in February, writing, “[I]t is perfectly legitimate for the United States to respond to the current ‘necessity’ posed by North Korea’s nuclear weapons by striking first.” And as CIA director, Pompeo suggested that the Trump administration is considering regime change. Bolton and Pompeo’s clear and strong preference for military action should be even more alarming considering their record of politicizing intelligence on these and other threats. Bolton was a senior official in the Bush administration during the buildup to the Iraq war. He was—and remains—a staunch supporter of that war and has been accused of pressuring State Department and CIA analysts to conform their assessments of Iraq’s weapons of mass destruction programs to his views. And during his time as CIA director, Pompeo was accused of pushing his predetermined view that Iran had been “cheating” on the Iran deal—even in the face of evidence and the assessment of the intelligence community that it had not. President Trump, Pompeo, and Bolton will put the United States on the path to a devastating war with North Korea, Iran, or both that would result in hundreds of thousands of deaths and possibly escalate into a nuclear exchange that could kill millions. The United States—and the world—can’t afford to take that risk. Ken Gude is a senior fellow for National Security at the Center for American Progress.